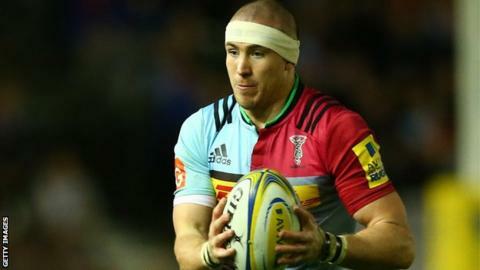 England full-back Mike Brown has committed his future to Harlequins after signing a new contract with the Premiership club. The 30-year-old came through the south-west London club's academy and has made 248 appearances for Quins since his debut in 2005, scoring 79 tries. Brown first featured for England in 2007 and has won a total of 43 caps. "I feel fit and strong. Over the coming years I will be playing at my peak," he told the club website. Harlequins have not disclosed the length of Brown's new deal but say he will have been at the club for "well over 15 years" by the time it expires, having joined their academy set-up in 2002. Brown won the Amlin Challenge Cup with Quins in 2011 and the Premiership title in 2012 - and hopes to bring further silverware to the Twickenham Stoop. "With the experience I have gained by playing international rugby it will give me every opportunity to achieve the personal goals I have set for myself - to win trophies for Quins, continue to play for England and hopefully be part of the 2017 British and Irish Lions tour," he said. Harlequins director of rugby Conor O'Shea described Brown as "the epitome" of what the club stands for. "I have watched him become one of the great full-backs of world rugby," said the Irishman. "He maintains the highest of standards off the pitch and will play at the highest level for many years. We are all delighted he wants to commit to his only club for what will be, in all likelihood, the remainder of his career." Brown played in all of England's matches at the 2015 World Cup, which they exited at the pool stage, but said this week that the "trust has gone" from the squad following leaks from the dressing room.